All benefits under National as well as local membership meetings and events. Events include the Annual Banquet and Fundraiser, Family Fun Shoot, Sensory Safari, Shooting Sports and more. The local chapter of Safari Club International, in North Florida includes the areas of Jacksonville and surrounding cities in North Florida and South Georgia. Join our organization by clicking on the Download Membership Form button below, complete the form and mail to the address below with a check for local and national dues. You will be notified by mail and/or email when your membership is effective. There are many benefits of membership in Safari Club International, as follows. 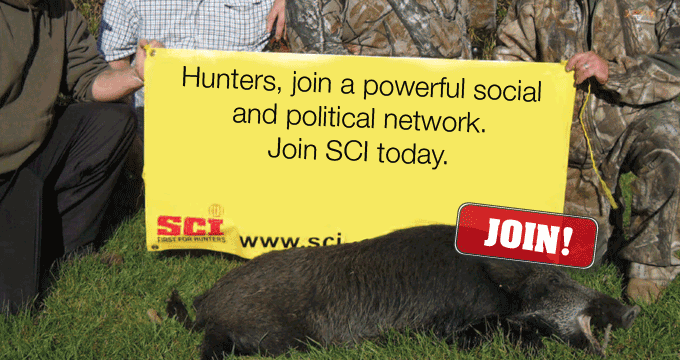 Free subscription to SCI's bi-monthly SAFARI magazine and monthly Safari Times newspaper, SCI Record Book eligibility, and Annual Hunters' Convention invitation (entrance fees still apply). Ability to run for office within the SCI organization. National member certificate, red and white member card and logo stickers. Ability to join local, national, and international chapters (If more than one chapter is joined, a $5.00 handling fee is applied). Member saves $15 on the Three Year Membership versus renewing each year with the One Year membership. Gold embossed Life Member Card and printed Life Member Certificate, gold Life Member pin in a velvet satchel and gold SCI logo stickers. Membership renewal from year-to-year is automated. Ability to join as many local, national and international chapters as desired (local chapter dues may still apply, but no handling fee involved). Eligibility to attend the Life Member Breakfast at the SCI National Convention (additional fee may apply). Spousal Life Membership at a discounted $750 (no publications included).